If you’re looking for a quick weeknight meal, whip up this healthy dinner with a spicy, Korean spin. 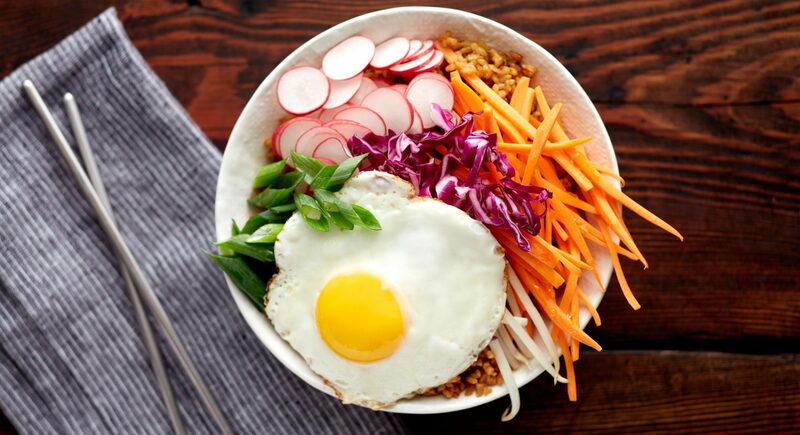 Be sure to toss everything together before eating—the runny egg yolk coats the vegetables and rice in a delicious, rich sauce. About 5 minutes before rice is done cooking, heat ghee in a large nonstick skillet over medium heat. Crack in the eggs and fry until the whites are opaque and the yolk is still runny. Divide rice between 3 bowls, and top with carrots, cabbage, bean sprouts, and green onions. Add one egg atop each bowl and serve immediately.